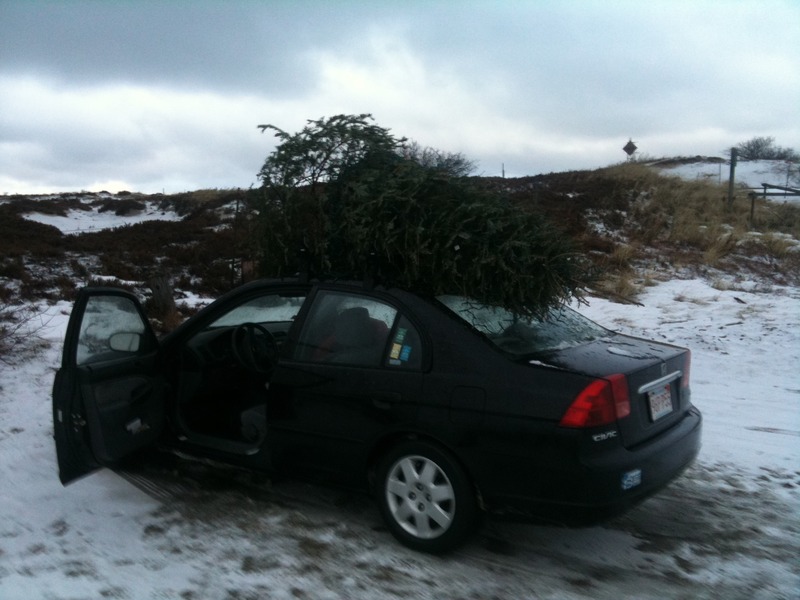 Last year I stopped by Ice House Christmas Trees and met the owner Eric and mentioned selling The Lobstar there. We’ll after the Turkey yesterday I received an email from said Christmas Tree purveyor, and low and behold there are now 4 of these Lobstars sitting there waiting to be part of your Christmas tradition. Thanks Eric for being willing to have us and I hope the Christmas Season is full of good tidings. Patience is a virtue — And much appreciated . This whole small business thing has so many great benefits, but with it comes an incredible amount of trust from the customer. People place orders and then you need to fullfill them. 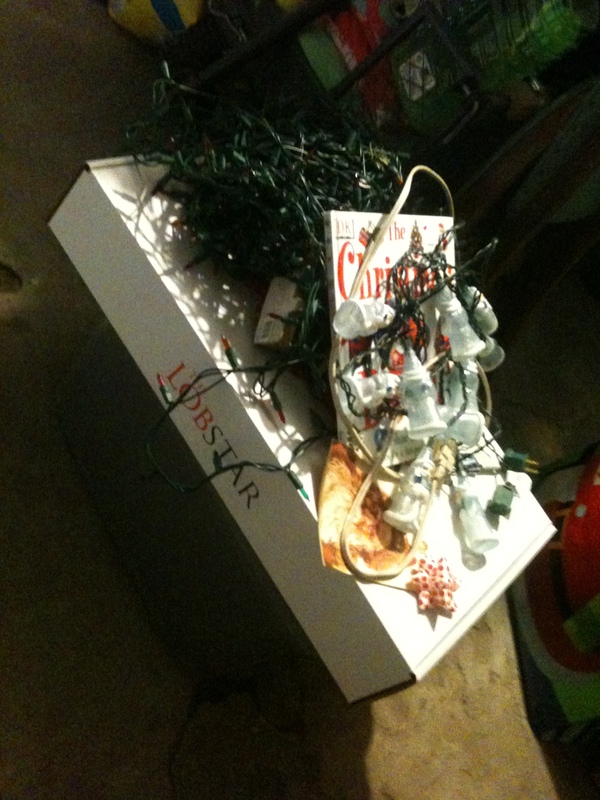 Only issue is Christmas stuff isn’t around all year long, and finding the Lobsters is not exactly that easy either. Last year I found myself in dire need of stars and travelling to every Home Depot or any other store trying to buy up as many stars as i could. This year it was trying to find a vendor to buy them directly. 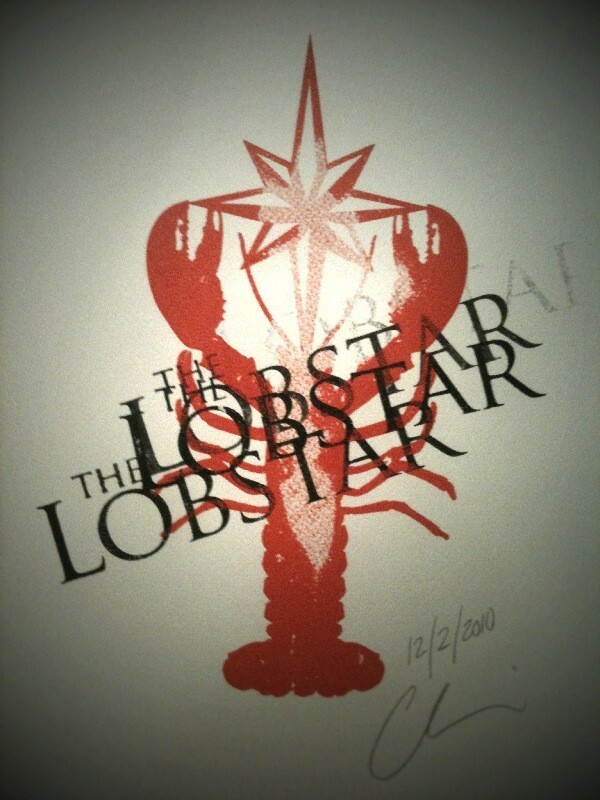 Once we found a supplier it took months to get them to the Lobstarfactory. So this post goes out to the folks that purchased Lobstars months ago, thank you for working with us, and understanding we make these things ourselves. From the star, to threading the pipecleaners through the body of the opaque Lobstar(which I have gotten much better at), to screenprinting the boxes, then wrapping them and shipping them. Thank you for supporting us, and after a weekend of making a bunch we actually have quite a few in stock. March is here, St Paddy’s is only a few days from now. So we taped a Lobstar sign on the car and went for a drive out to the Atlantic. This song came onto the radio, and it seemed appropriate to share. Some facts about this track “The song’s title appears nowhere in its lyrics; it is more easily remembered by the first line of chorus: “Stop, children, what’s that sound?”. It was/is known as a protest song, but theres none of that sentiment in this moment, more just sharing a glimpse of what happens when you love what your making, and have a chance to stop and look at whats going down. March Forward | Lobstar Season Opening Soon from Chris Brady on Vimeo. Trust me, I am a big fan of Riboflavin, any of the Color #5s, love frozen mixed vegetables, and grew up in a home that had no problem with Stop&Shop brand spicedrops. But over the past couple of days I think I may be starting to think organic. 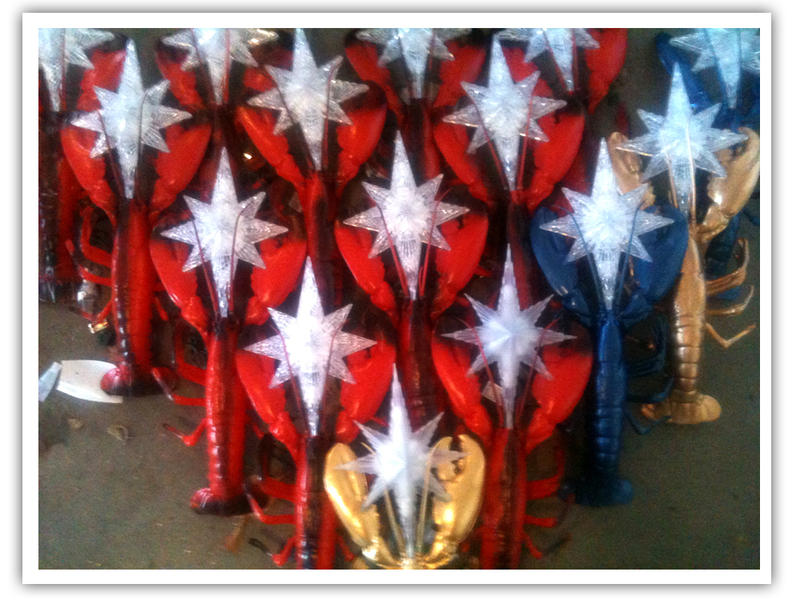 We had an order yesterday and The Lobstar Factory is always down to see where people may have heard of our bugs. Turns out a blog called Good Morning Gloucester had picked us up. We just wanted to send some praise their way, and we love it when this idea inspires. If it’s a laugh, a smirk, a retweet, a blog post, even a like, we cherish these moments. So as of today it’s all about organic. Maybe today I’ll have a salad, but skip the Bacos®. Written from a delayed Blue Line T.
FYI, The Lobstar Print makes a sweet iPhone Wallpaper. Most people put them out on trash day the first weekend after Christmas. Some take them to a Bonfire. Others throw them over the retaining wall. I have even heard they can be used to help build barrier beach dunes. Well here’s a less expected option, put it on your car and drive around the North Shore of Massachusetts. Step 1: Borrow an inverter so you can light it up from your car. Note: The Third Video is pretty funny. In a small fishing village, a Newfoundlander was walking Up the wharf carrying two at-least-three-pound live lobsters, one in each hand. So, the Newfie goes ahead of the Fisheries Officer to the end of the wharf where, under supervision, he gently lowers both lobsters into the water. As you all put your Crustacean’s away in thier box for the nap till next Season our breaktrough thought is store them on a shelf. Unless you have complete faith in your sump pump. It would be a shame to have the box all warped from a minor flood. 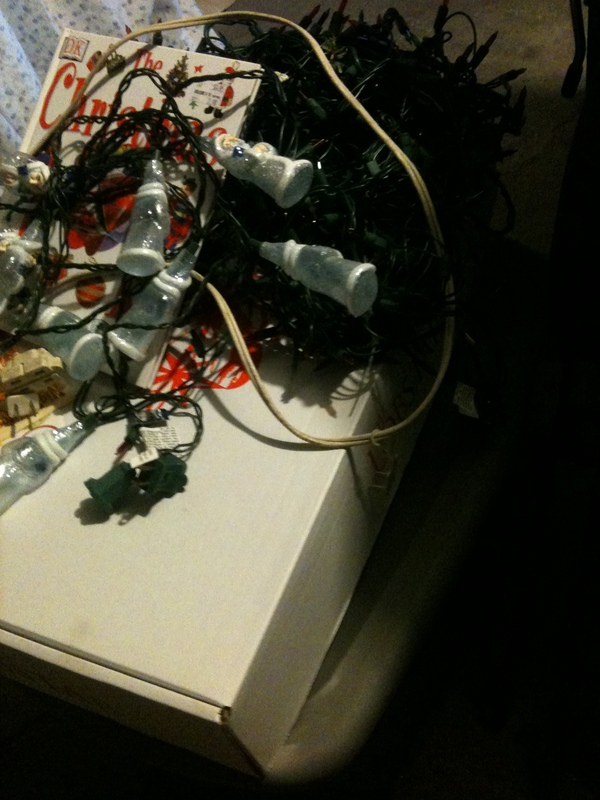 We also suggest checking to make sure not gingerbread or popcorn strings are in the box. Varmints have a tendency to love that stuff.